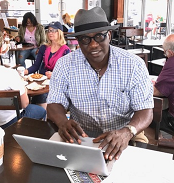 As I sit here looking out of the coffee shop window, not admiring the mounts of snow in Toronto, Canada, and contemplating the direction of my blog, I certainly appreciate the gifts that Haiti has received: Sunshine 365 days! But enough about me, some of you have inquired about the update on the project “Ayitic goes Global – Empowering Women through Digital Markets” and I am elated to inform you about this great endeavour that aims to educate Haitian youth (special attention paid to females 18-28) to gain employment in the digital data workforce. 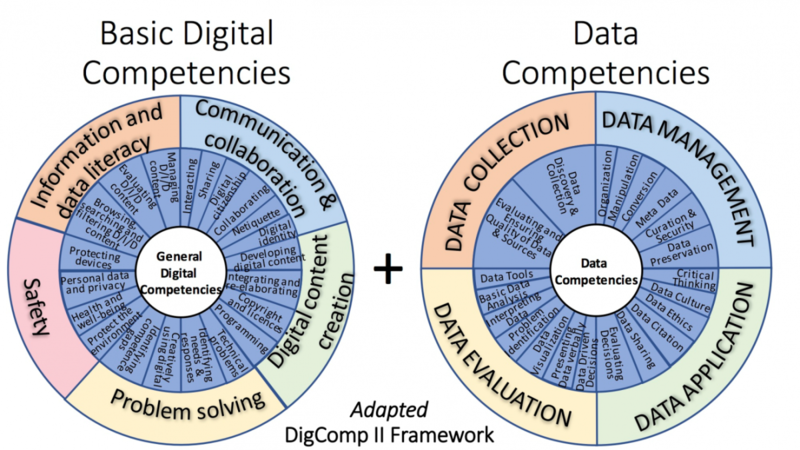 In our last update we had chosen the European Framework DigComp2.1 to model our approach to digital data education because it is robust, tried and tested, scalable and is an approach that was defined as holistic- taking into consideration knowledge skills and attitudes which are important for Caribbean countries. We love DigComp 2.1, but as any true Caribbean national would do, we scrutinised this model to the nth degree and realised that DigComp 2.1 clearly relates to digital education but it peruses the field of data education in a cursory manner, which was deemed insufficient to deal with the needs of the project. As a result, it was decided to augment the base framework with the established domains of data literacy, which are data collection, data management, data evaluation and data application. Incidentally, these silos follow the same granular manner in which digital literacy content was perceived making them a seamless fit with DigComp 2.1. Hence, they were added to DigComp 2.1 framework, resulting in a new architecture, our Adapted DigComp 2.1 Framework used to facilitate curriculum and course development. The Framework now has 9 domains that are seen in the diagram below. The Adapted DigComp 2.1 Framework is used to specify the various competencies that occupations must fulfil along with the level that must be attained. It assisted in shaping the skills profile of the workers, curriculum and course goals. This project is both collaborative and integrative involving many teams working together to ensure the results are effective and sustainable. There was research looking at demand and supply side issues, pedagogical and content delivery research and of course curriculum content research. These jobs were chosen based upon factors such as the availability of long-term contracting possibilities, skills that will be useful in the long-term without being affected by technology or unexpected industry changes, and skills which demonstrated upward growth in terms of leading to positions in high growth sectors for longer term upward mobility from micro work employment. Based upon the supply side research were able to ascertain student and environmental characteristics such as participant profile: persona of young women, curricular content: training needs based on identified current and future market demands (tailored content development) and infrastructure: bottlenecks, short term and long-term prospects. This information was important for the project because it assisted in shaping curricula content and delivery. Pedagogical strategy research was undertaken by Slash Roots and this study assisted in shaping broad curriculum design by identifying learning objectives, sequencing and organizing of content, specifying learning activities and deciding how to deliver content. The research determined that online learning activities should be asynchronous, information should be provided in byte size amounts to enable greater retention of information by learners, interactivity and variety was needed along with related graphics that will foster greater learner attention, interest and ability to relate to the topic under consideration, and modular learning essential for this cohort. After learners have undertaken this course and have achieved the required competencies seen in the diagram above they will specialize into one of two streams based upon their interests: Data Practitioners or Internet Practitioners. Course curricula have been developed for both streams with the intent that as future work on course content and delivery takes place the environment will be scanned for significant changes that will provide value to the course content and the occupational roles demanded by employers. This is especially critical given the ever-changing nature of the digital environment. When courses are delivered, curricula delivery and content feedback will be essential to ensure that needs of both learners and industry are being met. Curious minds want to know two things: why am I still in Canada in the cold and secondly when does the actual training start? The response to the first is “hmmmmmm…….” I can elaborate the latter curiosity. The training is on track to start in May 2018. From March to May should be viewed as developmental months within which Ecole Superieure d’Infotronique d’Haiti (ESI) will be coordinating the recruitment and selection process and the two beautiful Haitian women, Lise and Pascale, whom I met in Tanzania at an Open Data Workshop, will be instrumental in recruiting the trainees for our project. The Caribbean Open Data Institute (COI) will be actively engaged with course development between now and then. Other partners are working on the Monitoring and Evaluation (M&E) strategy. In closing off this update you must know that this is a research project to be delivered in Haiti with the goal of learning how to make it scalable so that it can be replicated throughout the Caribbean. This is crucial because other island in the Caribbean can benefit from training for jobs in the digital data field. You must also know that tomorrow the weather man says it’s going to be -5 Celsius with a wind-chill of -15C and another snow storm is expected. Shurland George M.Sc. PMP is a Consultant and Researcher specialized in Education, Tourism, Open Data and all things Caribbean development. He is especially excited since he recently found out that his Great Great Grandmother was of half CARIB decent (original people of the Caribbean) and now sees himself as the Original Caribbean Man.